A tube of copper gilded with a silver run of oak leaves in a clockwise spiral. The pummel set with a Moonstone in the ground end. The tube was designed to hold a rolled you scroll which included a blessing, inserted before completion. 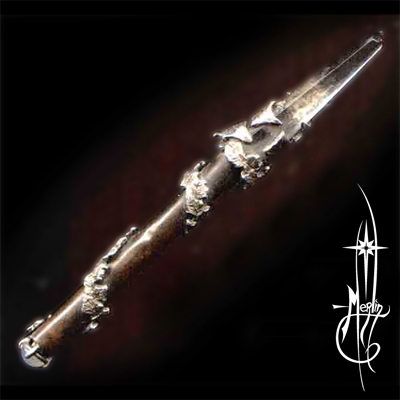 The purpose was to create a wand that could be easily carried and discreetly used. The person for whom I made it has harnessed the wand’s shape to help her stop smoking, hence the “shape of a cigarette”. Each time she want to smoke, she would take it out and hold it – remembering not to light the business end! Currently in a private collection.